Say please. Thank you. You’re welcome! Jenn – the first entry is not this week’s theme (it was last week’s theme) prefilled submitted in error … sorry! 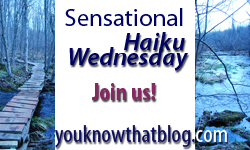 Love your set of Haiku!! Right on target! Manners = social intelligence. I wonder why it’s so little valued as something to be taught in today’s society? Hence the rioting in London etc! Thanks Jenn for the inspirational outlet! i try to teach my boys, and they catch on some. hopefully they wont be complete buffoons when they grow up. i tell ya, the ones who need manners training the most are customer service people and some waitresses! Your set of haikus is excellent. I agree we need to teach our children manners. It’s a little after 2 a.m. Wednesday, 17 August, in my part of the world and I’m shocked to find that there is “no one home.” Boo hoo!